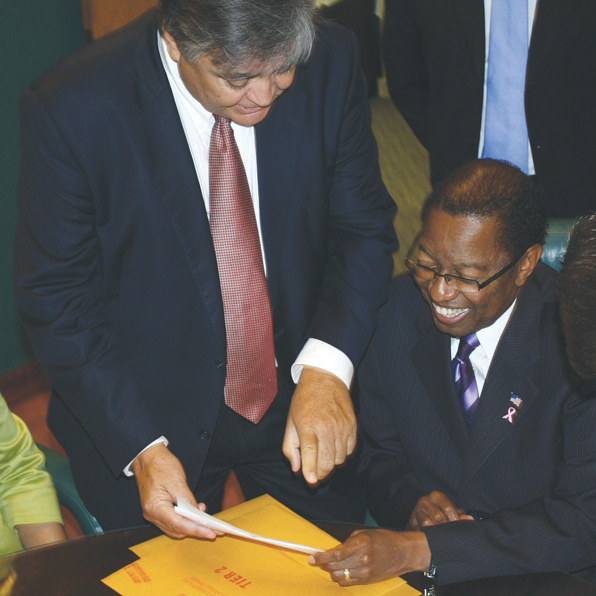 BATON ROUGE — Mayor-President Kip Holden had a career as a radio and television newsman before being elected as a City-Parish Councilman and then serving 20 years as a member of the Louisiana House of Representatives. Elected as Mayor-President in 2004, Holden has now served eight years and is proud of his support, along with that of the Metro Council, of the Green Light program of road and street improvements. A seasoned politician with a long history of beating the odds and plowing new ground, Holden is Baton Rouge’s first black mayor. His greatest political strength is probably his personal charm and likability. This personal magnetism led to overwhelming support from blacks and an approval rating of more than 60 percent from whites. East Baton Rouge Parish is a closely-divided political battleground where 54 percent of the voters are white. White voters are a key to Holden’s campaign to be elected to a third term. His support from whites dropped from 60 to 29 percent in the most recent Southern Media Poll by Baton Rouge pollster Bernie Pinsonat. Assuming Holden holds 96 percent of the black vote in the Nov. 6 primary election, he should breeze to another four-year term. But the danger for the Mayor-President is further erosion of support from white voters. If Holden slips below 25 percent among white voters, Republican candidate and Mayor Pro-Tem Mike Walker could have a chance of winning, Pinsonat told the Baton Rouge Press Club recently. Pinsonat said crime is the No. 1 issue troubling voters in East Baton Rouge Parish with 75 percent of local residents saying crime and drugs are a serious problem. Nearly 50 percent of East Baton Rouge voters fear for their own safety, Pinsonat said. As the parish sets an all-time record for murders, the crime issue could be weighing heavily on voters’ minds Nov. 6, he said. Traffic is also an important issue, with 68 percent of voters saying it is a problem. The Green Light Program is Holden’s hallmark achievement when it comes to traffic improvements. Two serious problems for the mayor are his repeated support of new taxes for downtown development, which voters smacked down, and his inability to work with members of the Metro Council. Some members of the Council say they have no relationship with the mayor or haven’t had a significant conversation with him in months. Five current or newly-elected Metro Council members have endorsed Mike Walker, including Councilman Ulysses Addison, a black Democrat. But the crime problem appears to be what is eating at Holden’s popularity the most, among both black and white voters, Pinsonat said. In that scenario, the Nov. 6 vote totals of independent candidates Gordon Mese and Steve Myers could be all-important. Although Holden’s popularity among black voters is not what it once was, the fact that President Obama is on the ballot Nov. 6 should result in a large black turnout, greatly favoring Holden. But if Mese and Myers can draw a few white voters away from Holden, that could force a runoff between Holden and Walker on Dec. 8. According to Pinsonat’s most recent poll, Mese and Myers are together drawing about 7 percent of the vote. If Walker makes it to a Dec. 8 runoff where Obama is not on the ballot, it will be a “whole new ball game,” one local pundit said. Despite the uncertainty of his political future and the strains on his popularity after eight years as Mayor-President, Holden seems to have loss little of her personal magnetism. Holden remains an effective goodwill ambassador for the parish and often speaks to convention groups coming to Baton Rouge. His self-deprecating humor invariably draws a favorable response. He is known to joke about his balding head and pull some conventioneer out of the audience to compare heads, bringing laughter to all. “We love your mayor!” one visitor said recently. At qualifying at the Clerk of Court’s office in August, the “old Kip” showed up, laughing and joking with Republican Clerk of Court Doug Welborn. In the gubernatorial election of 2011, Gov. Bobby Jindal won by a landslide statewide against token opposition. But he carried East Baton Rouge Parish with only 50.9 percent. That total suggests that the parish is tough but not impossible for Republicans to carry and that anything could happen in the Mayor-President’s race Nov. 6. Holden is married and has five children. He earned a B.A. from LSU, and an M.A. and J.D. from Southern. He holds many honors for his service to the community.